Is Tiger Woods the best golfer of all time? He’s ready to settle that debate once and for all and only you can stop him. Create a golfer using the most advanced Game Face technology ever released, and battle through five classic periods of golf with Tiger Woods and other legends like Jack Nicklaus and Arnold Palmer challenging you every step of the way. 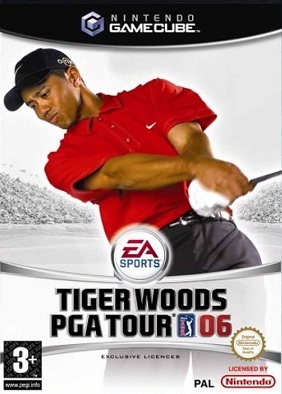 With new mini games, 19 licensed golfers, and 12 authentic PGA Tour courses, Tiger Woods PGA Tour 06 challenges you to call out your rivals and prove yourself as the greatest golfer ever. All-new Rival mode: Prove yourself as the greatest golfer of all time by taking on the legends in the prime of their careers--on their terms. Do you have what it takes to beat Jack Nicklaus in his heyday with a bag full of wooden clubs or Tiger Woods with his modern-day equipment? New shot mechanics: For the first time, both analog sticks control each shot from tee to green. The left analog stick controls your swing, and the right analog Shape Stick dictates ball trajectory and putt strength. Call your shots: Back your challenges with wagers before any shot or round. Bigger odds are given to special accomplishments, so reap the largest rewards for nailing the toughest shots. New courses and golfers: experience 15 beautifully detailed courses including Pebble Beach Golf Links, St Andrews, Reflection Bay, Doral Golf Resort, and more as you play as or against Tiger Woods and 16 other PGA Tour players, including the newly added Chris DiMarco, Mike Weir, Ian Poulter, and Luke Donald. New gamebreaker meter: build confidence to trigger gamebreaker situations, and boost your power and accuracy by making great shots and posting low scores.